Ten Years After is a four man rock and roll band that finds its beginnings in the 1960's, ten years after the birth of rock-n-roll, hence the name. The original lineup was, Alvin Lee on guitar and vocals, Ric Lee (unrelated) on drums, Leo Lyons on bass, and Chick Churchill on keyboards. Recently, Joe Gooch has replaced Alvin Lee. They have recorded a huge list of albums, most of which are listed here. Ten Years After was one of the bands at Woodstock and at The Isle of Wight Festival. They can be seen and heard in the Woodstock DVD, as well as The Isle of Wight Festival DVD. Ten Years After perform their signature song, I'm Going Home, in the Woodstock movie and I Can't Keep From Crying in the The Isle of Wight Festival movie. The following is a list of CD's by Ten Years After. The song I Get All Shook Up is great. The rest of the CD amounts to 1980's hard rock which fits since it was released in 1989. About Time seems sterile compared to other TYA albums. I Get All Shook Up, is also on the Pure Blues CD. Buy this CD and read reviews at Amazon.com! On March 30, 1972 Deram released a compilation of unreleased tracks and singles called Alvin Lee And Company. Most of the tracks come from 1968 recording sessions with the CD containing a few more tracks then the LP. The Sounds, Hold Me Tight, and especially Portable People are 3 gems. The other songs hold their own, and its nice to have a single version of I'm Going Home for those days you don't have time for a marathon version. Buy this CD and read reviews at Amazon.com! This is another greatest hits CD. I have not heard it. Buy this CD and read reviews at Amazon.com! I have not heard this CD, but I think it is a greatest hits CD. This is a greatest hits CD that I have not heard yet. Buy this CD and read reviews at Amazon.com! This is a live CD recorded in concert July, 16, 1988 in Giessen, Germany. The CD is listed as being for promotion only and is therefor hard to find. TYA as usual put on a good show with a very rich and thick sound. Chricklewood Green is a must have TYA CD. Track after track is excellent. Each song has an outstanding feel to it. I've always gotten a kick out of Year 3,000 Blues which chronicles a run for your life more than 1000 years into the future. It is the perfect song for fans of the TV show Futurama. I recommend the Mobile Fidelity Sound Lab version of this CD which is mastered better and also comes with the album Ssssh. Chricklewood Green was first issued April 1970. Buy this CD and read reviews at Amazon.com! Chricklewood Green is one of the best TYA recordings and now it is available with two bonus tracks. I guess I have to purchase this CD for the third time so I can hear those bonus tracks. Buy this CD and read reviews at Amazon.com! This is a greatest hits CD. Buy this CD and read reviews at Amazon.com! This is yet another greatest hits CD. Buy this CD and read reviews at Amazon.com! I think this is greatest hits CD too. Buy this CD and read reviews at Amazon.com! This looks similar to Recorded Live, but I have not heard it. Maybe I should buy it? Buy this CD and read reviews at Amazon.com! This CD was recorded live at the Reading Festival in 1983. TYA live is always good and I really like the Extension On One Chord portion of track #7. This live recording was made from a 1990 show in Nottingham. It contains 3 tracks from their 1989 release About Time. Those 3 tracks translate better on Live 1990 than they do on About Time. Ric Lee plays his drum solo song Hobbit once again, but this time with a more modern sounding drum set. He pulls it off well, and Hobbit becomes one of the highlights. Track 9 is really cool too. Buy this CD and read reviews at Amazon.com! This is a live CD recorded in New York in 1971. It is interesting from a historical point of view. The sound really does have a early 1970s sound to it. The sound quality is so so. This is an excellent two CD live album. This is a good choice if you are looking for the live TYA sound. Buy this CD and read reviews at Amazon.com! I was also told about this CD by a web surfer, but I have not heard it. Buy this CD and read reviews at Amazon.com! More Than 20 Years Later is a live CD recorded in Rome on March 17, 1971. It is a good performance but the recording quality is really bad. The CD cover and booklet is quite entertaining. The booklet has some cool concert photos. On the back of the CD box there is photo of Alvin Lee with his cheeks all puffed out while he plays some high notes on his guitar. The cover also states incorrectly that Led Lyons is on bass, Chuck Churchill is on keyboards, and Nick Lee is on drums. This is another CD that a web surfer told me about, but I have never heard or seen it. This is a great CD. It starts out real smooth, grooves through the middle with occasional jams, and then ends with a tale of a nights adventures. This album first hit the stores via LP form in 1974. Unfortunately, it looks to be out of print. Buy this CD and read reviews at Amazon.com! This is another greatest hits CD. Buy this CD and read reviews at Amazon.com! Pure Blues is a compilation of Alvin Lee and Ten Years After blues songs. 6 of the 13 songs are TYA songs. Some of the musicians of note on the Alvin Lee songs are Clarence Clemons, George Harrison, and Jon Lord. The one song that I like from About Time, I Get All Shook Up, is also on Pure Blues. Pure Blues was issued in 1995. Buy this CD and read reviews at Amazon.com! Recorded Live was released in 1973 as TYA's official live CD. Unlike the bootlegs around at the time, Recorded Live was a quality recording using the Rolling Stones' mobile recording truck. It does come across as a great show. The sound is rich and thick with songs stretching to include various twists and turns not found on the studio recordings. The LP was a 2 record set, but the CD is alone in its box. In order to fit 2 records on 1 CD, the song Hobbit was omitted. Even without Hobbit, it is a great CD. Buy this CD and read reviews at Amazon.com! 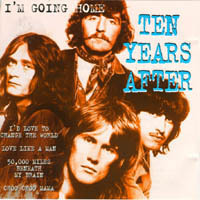 Ten Years After hit the scene ten years after the inseption of rock & Roll music, hence the name. It is only fitting that they would created an album with traditional rock & Roll stylings. The album, which was first released in 1972, has a heavy thick sound with added blues, lots of rich guitars, and a 1950's style song to end it. It is filled with "must have" songs. Buy this CD and read reviews at Amazon.com! I have not heard this CD yet. Buy this CD and read reviews at Amazon.com! A Space In Time contains the FM radio standard, I'd Love To Change The World. This is the song that drew me into the world of Ten Years After. When I was in college, I walked into the CD store near campus. You know the one that smelled like incense and had all those wild posters on the wall. As I browsed, this CD cover that had 4 guys with long hair sitting in a grassy field caught my eye. I looked at the song list and noticed the song I'd Love To Change The World. I asked the clerk if this was the song I had heard on the radio. He said, "Yeah, they are the only band that did that song." I bought the CD. When I played the CD, it blew me away. Not only was that one radio hit good, but all the songs were incredible. The album is a uplifting musical ride. A Space In Time remains one of my favorite CDs. It was released in 1971 and remains a great album from start to finish. Buy this CD and read reviews at Amazon.com! Ssssh. was released in September 1969. Highlights for me include If You Should Love Me, and I Don't Know That You Don't Know My Name. I recommend the Mobile Fidelity Sound Lab version of this CD which is mastered better and also comes with the album Chricklewood Green. Buy this CD and read reviews at Amazon.com! This limited edition CD has 2 great TYA albums on one CD. Mobile Fidelity Sound Lab has mastered these 2 albums from the original master tapes. This makes for a more accurate recording then the regular issues of these compact discs. The CD is manufactured using 24-karat gold instead of the standard aluminum. Gold, in theory, performs better than aluminum. Please check out my reviews of the individual albums for more information on the music. Buy this CD and read reviews at Amazon.com! This is a fun recording from their earlier years. Stonedhenge is their 3rd album and was released February 22, 1969. Buy this CD and read reviews at Amazon.com! 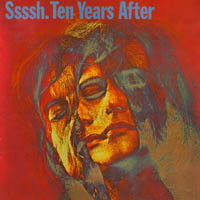 This is the very first Ten Years After album being released on October 27, 1967. It is heavy in the blues and varies from toe tapping jams to smooth thick music. Don't Want You Woman is an excellent acoustic number that fits in well with the usual electric songs. This album shows that TYA was creating top rate music from the get go. Buy this CD and read reviews at Amazon.com! This edition of the Ten Years After self titled recording has additional bonus tracks. I have not heard it yet. Buy this CD and read reviews at Amazon.com! I have not heard this CD, but I was told it existed by a web surfer. If you know where I can get a copy, let me know. Undead was released on August 16, 1968 as TYA's second album. It is a live ablum recorded in London's Klooks Kleek club. The recording captures it all, the announcer, the crowd, and of course the music. It captures the feel of a small club like no other CD I own. Track one starts out with over 9 minutes of great music, the middle keeps it going, and the album ends with the TYA classic, I'm Going Home. This is the origional version of I'm Going Home and is of course a huge jam. The album includes an energenic version of Woody Herman's At The Woodchopper's Ball. Buy this CD and read reviews at Amazon.com! This is another greatest hits CD, however, this CD has been remastered. I have not heard it yet. Buy this CD and read reviews at Amazon.com! This is a greatest hits CD. I have not heard it. Watt was released on the Deram label in December 1970 and after 1975 was issued by the Chrysalis label. I purchased Watt soon after I bought my first TYA CD, A Space In Time. Watt is a smooth thick musical ride and has spent a lot of time pushing notes through my hi-fi stereo. Buy this CD and read reviews at Amazon.com! You can find guitar tablature for some TYA songs at www.alvinlee.com. If you have any questions, comments, corrections, or if you know of any other Ten Years After CD's please feel free to e-mail me. Please send e-mail to Torrey. If you like good rock and roll, you will really dig Ten Years After. Good luck on your musical adventure. Go to the Ape Camp's Musical Artist Information Area. Go to Photographs of Musicians: A Portfolio by Torrey Nelson. Go to Torrey's Great CD Picks. Go to The Music Place. Go to Ape Camp Home.